Presented in a retail box. 1x "THE SHAMPOO” IS A COLOUR PROTECTION, GENTLE CLEANSING SHAMPOO THAT PRESERVES HAIR COLOUR AND SHINE. IT CONTAINS MILK PROTEIN AND KERATIN PROTEIN, WHICH HELPS PROTECT HAIR FIBRE. IDEAL FOR SENSITIVE HAIR. 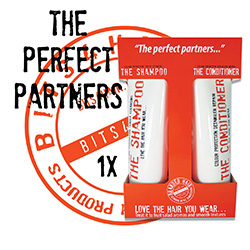 1x "THE CONDITIONER” IS A COLOUR PROTECTION AND DETANGLER REPAIR CONDITIONER WHICH CLOSES THE CUTICLE. IT CONTAINS MILK PROTEIN, KERATIN PROTEIN AND SILK AMINO ACIDS TO LEAVE HAIR HYDRATED AND NOURISHED. 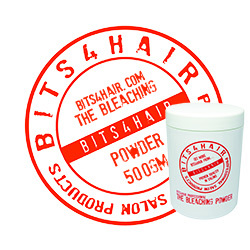 Size: 250ml Tube BITS4HAIR "THE SHAMPOO". 250ml Tube BITS4HAIR "THE CONDITIONER". "THE SHAMPOO” - APPLY TO WET HAIR, LATHER, RINSE AND REPEAT. THEN RINSE HAIR WELL AND FOLLOW WITH "THE CONDITIONER”. "THE CONDITIONER” - APPLY TO HAIR ALREADY SHAMPOOED WITH "THE SHAMPOO” AND LEAVE FOR 3 TO 5 MINUTES. THEN RINSE HAIR WELL AND STYLE AS DESIRED. Ingredients (THE SHAMPOO): AQUA, SODIUM LAURETH SULFATE, COCAMIDOPROPYL BETAINE, DISODIUM COCOAMPHODIACETATE, ACRYLATES COPOLYMER, COCO-GLUCOSIDE, GLYCERIN, GLYCOL DISTEARATE, HYDROLYZED MILK PROTEIN, MEL, HYDROLYZED KERATIN, HYDROLYZED SILK, PARFUM, TRIETHANOLAMINE, CITRIC ACID, POLYQUATERNIUM-11, METHYLISOTHIAZOLINONE, STYRENE/VP COPOLYMER, SODIUM CHLORIDE, METHYLCHLOROISOTHIAZOLINONE, ALPHA-ISOMETHYLIONONE, LIMONENE, COUMARIN, CI 17200, CI 19140. Ingredients (THE CONDITIONER): AQUA, CETEARYL ALCOHOL, CETRIMONIUM CHLORIDE, HYDROLYZED MILK PROTEIN, MEL, HYDROLYZED KERATIN, HYDROLYZED SILK, PARAFFINUM LIQUIDUM, PARFUM, GUAR HYDROXYPROPYLTRIMONIUM CHLORIDE, BEHENTRIMONIUM METHOSULFATE, METHYLCHLOROISOTHIAZOLINONE, CITRIC ACID, METHYLISOTHIAZOLINONE, ALPHA-ISOMETHYL IONONE, COUMARIN, CI 17200, CI 19140.